Stitch a simple circle in rainbow colors, fold it in half, and then crochet a zipper into the outside edges to create a cute coin purse. 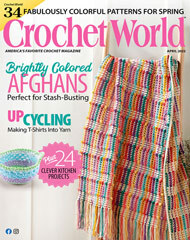 This e-pattern was originally published in the April 2013 issue of Crochet World magazine. Size: 4 3/4" x 2 3/4". Made with light (DK) weight yarn and size F/5/3.75mm hook.